Who says North Texas can’t be “green”? We may not have the rain, but at least we’re working on the whole ‘being more environmentally friendly’ aspect. On September 17th ECOFEST Arlington will take place at Levitt Pavilion where the Free Fall Concerts have been taking place. This family oriented event not only helps to build a sense of community but it also stimulates environment awareness across North Texas. Local business have been invited to showcase their green products as well as do-it-yourself home solutions, and if you have a business and would like to participate please feel free to come. The business will be positioned along the festival streets surrounding Founder’s Plaza. There is NO COST to attend!! 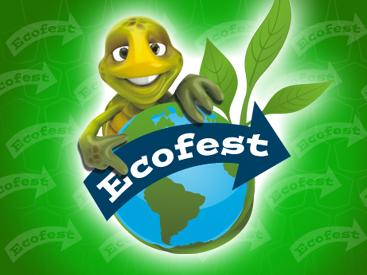 Ecofest 2011 begins at 10 am on Saturday 9/17 and will last until 10pm that night. Of course we’ve got local musical artists performing also in the Pavilion like: Velvet Love Box and Spoonfed Tribe. Ecofest Arlington is presented by Naturally Fun (Arlington Parks & Recreation) and the concerts are presented by Safe Harbor Insurance Solutions. **For a map of the festival, click here. 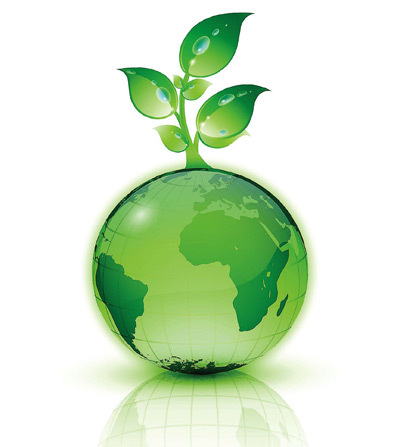 Let’s reduce consumption of our natural resources and shoot to help reduce, repair and prevent environmental problems in the future. Start with simple things like turning off the lights if you’re not using a room or if you can use the sunlight from the window; Not running the water when brushing your teeth; Carrying your own reusable grocery bags or choosing paper over plastic; Carpooling with neighbors; Unplug seldom used appliances (and chargers when not in use) that contain only a few items which may also save on your utility bill; Set your computer to sleep or hibernate when you’re done using it; Reuse office print-outs as notepads; Recycle your aluminum cans, plastic bottles & newspapers. 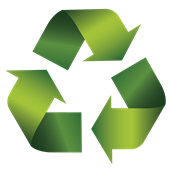 These are just a few tips on being a little “greener” or eco-friendly. For more information, resources and some fun check out the 2011 Ecofest in Arlington at Levitt Pavilion and Founder’s Plaza, Saturday Sept. 17th (10am – 10pm)! 10:00AM – ECOFEST open for business! 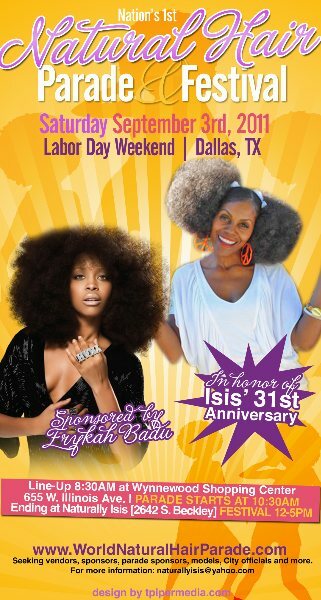 This Labor Day Weekend don’t call Tyrone, but instead hit up his bare-all boo Erykah Badu and her good friend Isis Brantly owner of Naturally Isis who are presenting the 2011 Natural Hair Parade and Festival! 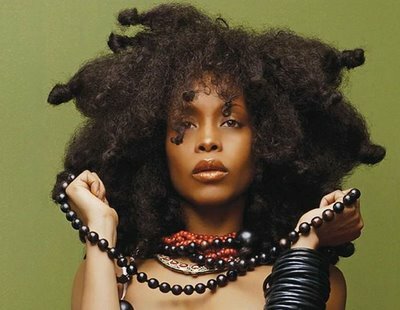 On September 3rd Dallas native Erykah Badu won’t be strolling down Dealey Plaza naked this time but Illinois to Beckley in her “normal” natural state rather. Badu (as well as the Institute of Ancestal Braiding) is sponsoring this Free event which is a celebration of both natural hair and African economic power. 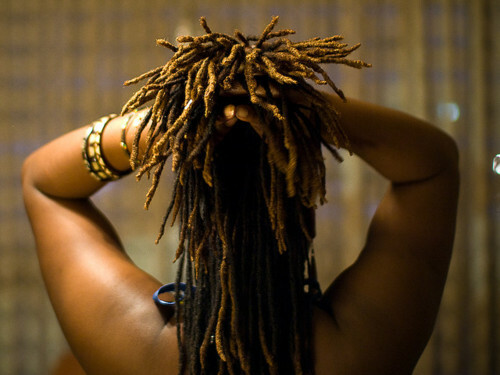 Isis Brantley is the first entrepreneur to own a natural braiding salon in the DFW area and she continue advocating economic empowerment and pride within the African American community of North Texas. Isis is the brains behind The Natural Hair Parade and Festival set to take place on September 3rd at the Wynnewood Shopping Center located at 655 W. Illinois Ave. 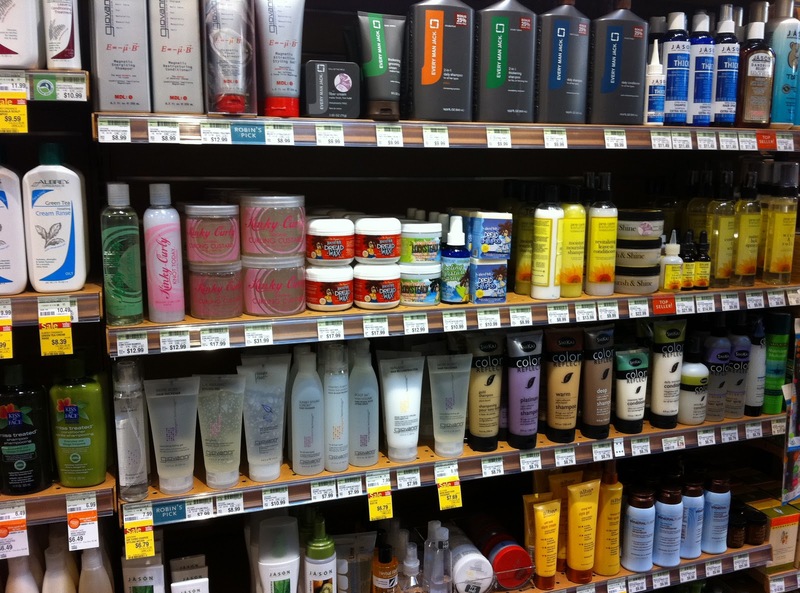 The parade will continue on down to the Naturally Isis Beckley location found at 2642 S. Beckley. The parade and festival will include: Happy Hair Village, vendors, Grooming and natural hair demonstration, a hair show and other fun activities for the community! Isis’ Window-Seat supporter has put her frequent flyer miles on hold for a couple days and challenged her friend to get 400 people to march and participate in the parade. She will be speaking at the event as well. Let’s hope they’ll ALL be fully clothed, but we can certainly expect some eccentric natural hair styles to compliment the streets of Oak Cliff/Dallas. Isis says they chose September 3rd as the date of The Natural Hair Parade and Festival because “it is a labor of love”. Tell your friends and loved ones about this unique Labor Day Weekend event and when Tweeting about it mention the hashtags: #NaturalHair and #LaborofLove. If you’d like more information on sponsorship and exhibitors click here, as The Natural Parade and Festival is still open to more. Late registration is $150, and you can also donate or make payment here.To volunteer contact Naturallyisis@yahoo.com or call 214-329-3820. <This past June we had the NBA Championship parade through downtown, but now Dallas is Pleased to host the Nation’s First World Natural Hair Parade and Festival September 3rd starting at 10am!